I listen to podcasts all the time. When I’d like distraction in my mind from the discomfort in my body, I prefer to just lay back and listen. Sometimes too instead of the white noise of the news, which let’s face it, has been so disturbing lately, I will listen to a podcast while doing some household chores like dishes or cleaning or decluttering instead of mindlessly having the television cable news on. I love to learn and podcasts have been a terrific outlet for that! Hopefully one day soon when I’m strong enough to do my daily walks again, podcasts will accompany me on those too! And there is SO much excellent content out there. I’ve curated some really juicy ones for you - some on health, but not all. Because we do not have to be thinking and learning about wellness all the time, right? And I’ve highlighted some particularly outstanding episodes for you too. note :: links to podcasts and specific episode are to the Apple podcast app, but all of these are available where ever you enjoy podcasts such as Stitcher or Spotify, and also just online in your browser. This podcast is a relatively new find for me. Their title, which sounds draconian, is belied by the actual helpful and friendly advice. They claim eating better is not hard, and I appreciate their food “hacks - whether tips on eggs, or how to use your slow cooker or what kitchen tools do double duty or how to shop in Costco or Trader Joe’s. I found them because of their two part interview (Part 1 + Part 2) with Seamus Mullen who wrote Real Food Heals, one of my current favorite cookbooks. Seamus was really, really sick, and a top New York chef, who, with the help of functional medicine doctor Dr. Frank Lipman, figured out how to use food to support his healing and best health. It’s a really inspiring story. And I find their podcast provides information I find really helpful and interesting. 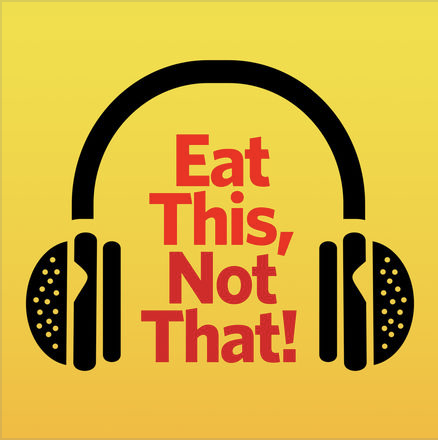 This one is also a newer find; they’ve only been podcasting since August 2018, though I have long been a fan of her blog, recipes, work and general vibe. Ella Woodward seems to put out a new cookbook every years since 2015. 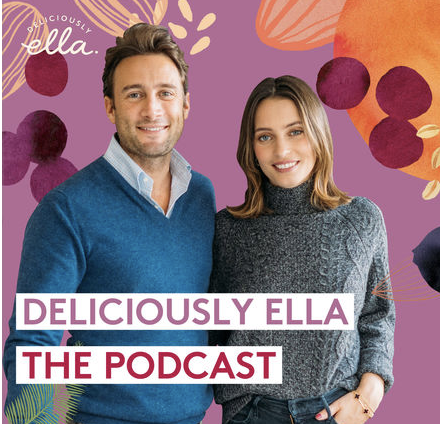 And she has a new one coming out in April 2019, Deliciously Ella The Plant-Based Cookbook: 100 Simple Vegan Recipes to Make Every Day Delicious. She and her husband, Matt, do not disappoint in this podcast, and I’m so glad that they decided to do one. The first episode I listen to was an interview with Shahroo Izadi, a behavioral psychotherapist about how to create positive, sustainable and long lasting changes. (I liked it so much I ordered her book The Kindness Method on Amazon - from Great Britain!) Then I saw that they also interviewed Matt Haig, who I’ve long admired and wrote about here. And that episode solidified their place in my regular podcast rotation. In addition to these great interviews, they also discuss food and business. I’ve been a YouTube fan of both of the Ikonns for years. (Mimi’s channel is here; Alex’s channel is here.) Their travel vlogs are wonderful escapes from my bed. Then I discovered they also created one of my favorite tools - The Five Minute Journal, and I was hooked. I pretty much watch everything they produce. Their Instagram feeds offer daily inspiration too. (Mimi’s here; Alex’s here) They are so enlightening and so upbeat, but not in a way that feels insincere. They’ve both had difficulties so they don’t casually brush over real pain or difficulties or obstacles, and they offer paths forward and ways of being that feel doable. They launched a podcast just in February 2019, and already they have been providing amazing content and fascinating interviews. Three favorites are Overcoming Self-doubt with Celest Pereira (about her yoga career and teaching yoga); A Life Changing Conversation with Jim Kwik (about his brain injury and meta-learning); Selling Billions in Real Estate with Daniel Daggers (about what qualities high net worth people have in common). The discussions just between the Mimi and Alex are illuminating too - this episode on perfectionism is one I especially appreciated. Tami Simon hosts this series, and she just marked 500 episode. I’ve been listening to this podcast for years and probably have enjoyed over 100. Just the other day, I was listening to one and enjoyed it so much I thought to myself that I wanted to read the book that went along with that episode. Before I took that thought further, a friend sent me that book for my birthday! She had heard the same episode and knows me well enough to know that I’d like it! Tami’s superpower skill as an interviewer is that she always seems to ask the questions you are wondering about. Her skepticism is put forth in a kind, curious way that gleans fantastic answers. Elizabeth Lesser, cofounder of Omega Institute and author of Broken Open, on growth and handling fear. Kate Stillman on how to thrive in your body by adapting Ayurveda habits to modern life. I found Ashley Wood when she interviewed Mimi Ikonn on her podcast, Manifest This. And then a treasure trove opened up before me. She is a good interviewer too, and I just love her soothing, dulcet voice. Her goal is to support our own inner knowing and intuition so we can return to ourselves and live a full life of meaning, ease and joy. When you’re sick and miserable, that’s pretty appealing!! Her topics may seem esoteric and a bit out there but the content resonates and is actually helpful, I find. Sarah Dunant is a historian and a novelist who knows how to tell good stories. This podcast from the BBC only comes out once a month, but it is one I keenly look forward to. She takes a current theme and spins it into the past to find answers and connections to our present concerns. Here is Dunant’s own announcement in The Guardian of her podcast which accounts for why she believes history is still relevant. (I agree with her!) I just love love love her storytelling; I always learn something fascinating. The episodes are all under 30 minutes and she interviews historians who tell good stories too. Of course, done by the BCC, the sound production is excellent and really slides you into the past. maybe my favorite (though it’s hard to say so!) on when children questioned adult authority from the Parkland student activists to Joan of Arc. This site curates podcasts on a regular basis. This site is a new discovery for me. Just yesterday a friend tagged me on Facebook when she posted their current list of recommended podcasts. The list looks outstanding! A podcast on a Jamaican writer who won the Booker Prize, a primer on Supreme Court cases, and another on the wonder of libraries! Looks like a bunch of treasures! Do you prefer audio books or podcasts? What do you think makes for a good interview? What kind of content do you most enjoy taking in by listening? Do you do other things while listening to podcasts? If so, what?